Sangria is a wine-based fruity punch that is perfect for large gatherings. The recipe includes a full bottle of wine so it'll be enough to make an entire pitcher. While red wine is common for sangria, white wine makes a fantastic base as well. Sangrias make great party punches because they are not too strong, are easy to prepare ahead of time, and can be made in large volumes. A white wine sangria brings a lighter profile to the punch and is an excellent alternative to a red wine drink. The ingredients enhance the fruity flavor of the white wine in this recipe. 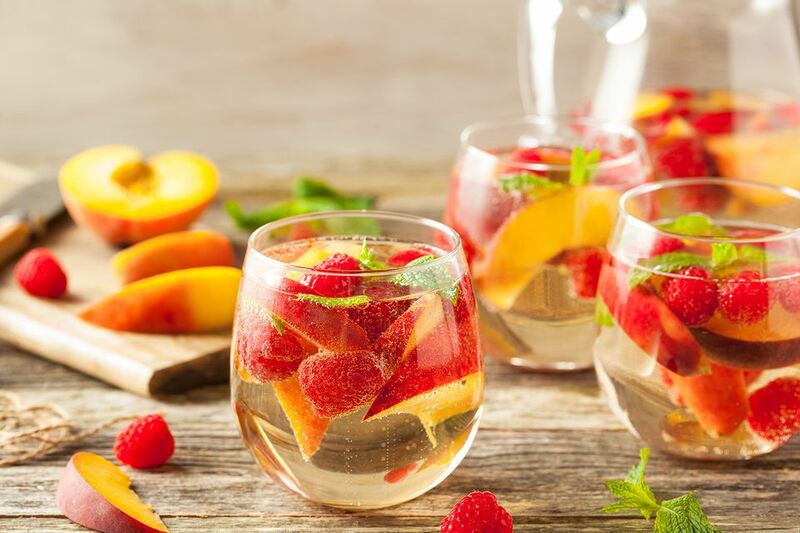 Including peaches, strawberries, and lemonade transform a bottle of white wine into the perfect punch for backyard barbecues and other summer parties. Pour wine into a serving pitcher and squeeze the juice wedges from the lemon, orange, and lime into the wine. Add the citrus fruit wedges (leaving out seeds if possible) into the serving pitcher. Add the peach, strawberries, lemonade or limeade, sugar, brandy, and optional pineapple into the pitcher. Add ginger ale and ice just before serving. If you are short on time or would like to serve this sangria right away, use chilled white wine and serve the sangria over lots of ice. Any white wine will work in this recipe. Choose something that you enjoy drinking and will pair well with the sweet fruits in the recipe. Sauvignon Blanc, Chardonnay, and Riesling are all excellent choices. Another option is Pinot Grigio since it's easy to find and offers a great variety of labels to choose from. If you're in the mood for something a little more unusual, hunt down a bottle of Albarino, Gewurztraminer, or Viognier. Just Peachy Sangria: This sangria uses fresh peaches and peach schnapps, living up to its name. If you can find fresh mango, that adds a sweet and exotic flair. New Zealander Sangria: This sangria is light and refreshing. It's a simple recipe since wine is the only alcohol, but its flavor is enhanced with kiwi and tangerine. Passionfruit Sangria: The passionfruit sangria includes the tropical fruit in juice form, so it can be made year-round. The recipe also uses brandy, kiwi, and pineapple. White Lightning Sangria: This sangria gets an extra kick from vodka and incorporates grape juice, fresh apples, grapes, and pineapple in this tasty beverage.